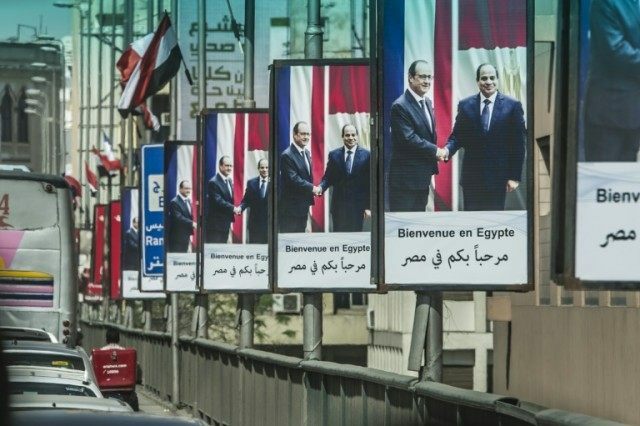 Cairo (AFP) – French President Francois Hollande arrived in Cairo on Sunday for a two-day visit seen as a boost for President Abdel Fattah al-Sisi, with security and economic cooperation on the table. Hollande arrived from Beirut, as part of a regional tour that will also take him to Jordan. A beaming Sisi greeted the French president at Cairo airport, live footage on state television showed. Hollande arrived with a delegation of business leaders in tow, and he and Sisi are expected to also discuss Middle East crises including the war against the Islamic State group and the Israeli-Palestinian conflict. The question of human rights will be in the background. Hollande has been among Sisi’s strongest supporters in Europe, since the former army chief overthrew his Islamist predecessor and launched a bloody crackdown on protesters in 2013. France has already signed major arms contracts with Egypt since, and Hollande and his delegation are expected to agree economic deals throughout the visit. These agreements will include deals on funding transportation and renewable energy, the French presidency has said. On the eve of Hollande’s visit, human rights groups including Amnesty International had criticised what they called France’s “deafening silence” on rights violations in Egypt. The crackdown has spread to secular and leftwing dissidents who had supported Morsi’s overthrow but then turned on Sisi.